There were a few ups and downs at today’s meeting, and a fight almost broke out --- but I get ahead of myself. Ahem. Let’s start over. It was a beautiful morning in Marana, AZ, as the stalwart Marana Rotarians gathered once again at Nana’s Kitchen. President Mary Straus welcomed three guests: Rotarian Bob Selinger from the Eloy Rotary Club joined us to extend an invitation to their golf challenge on Robson Ranch’s new course. A celebration dinner will follow at 6pm. This is all on Sat Mar 26. Rotarian Gary Jang was visiting from Bothell, Washington. And Ramon Campazano was a guest of Vanessa Ruiz. Ramon is the Vice President of the Tucson Hispanic Chamber of Commerce. It’s really nice to have visitors, and we welcomed Bob, Gary, and Ramon! Mary, John Dooling, Dan Contorno, and Randy Brooks, along with Honorary Member Deb Hume, worked on the tortoise habitat last Saturday at Coyote Trails Elementary school. They moved 61 80-lb bags of concrete and dug into rock-hard ground for hours. Or was it 16 tons of concrete? Anyhow, good job! The kids will love it, not to mention the tortoises. ALL HANDS ON DECK for the Tour de Cookie! Dan updated us on preparations underway. This is a big event and everyone’s help will be needed. 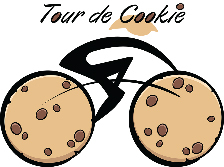 Check out the website at www.rotarytourdecookie.org. Club Board meets at 5:30pm at Maeve’s Edward Jones office. 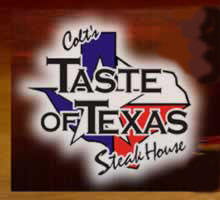 Our Club’s 5th Tuesday social at Taste of Texas, 5:30 – 7pm. Chaps required. It’s getting closer! Get your cookie on! Every time there are 5 Tuesdays in a month we take the 5th Tuesday off! Instead of a morning meeting, we have an evening social, and March 2016 provides just such an opportunity. So put a note in your calendars: no morning meeting Tues Mar 29. Instead, let’s get together at Taste of Texas at 5:30pm to socialize. We thank Harold Burtzloff for organizing this event. See you there! Resident biochemist Jo Holt gave all five of her Happy Bucks in honor of Pi Day, which had occurred on Monday (3/14/16). 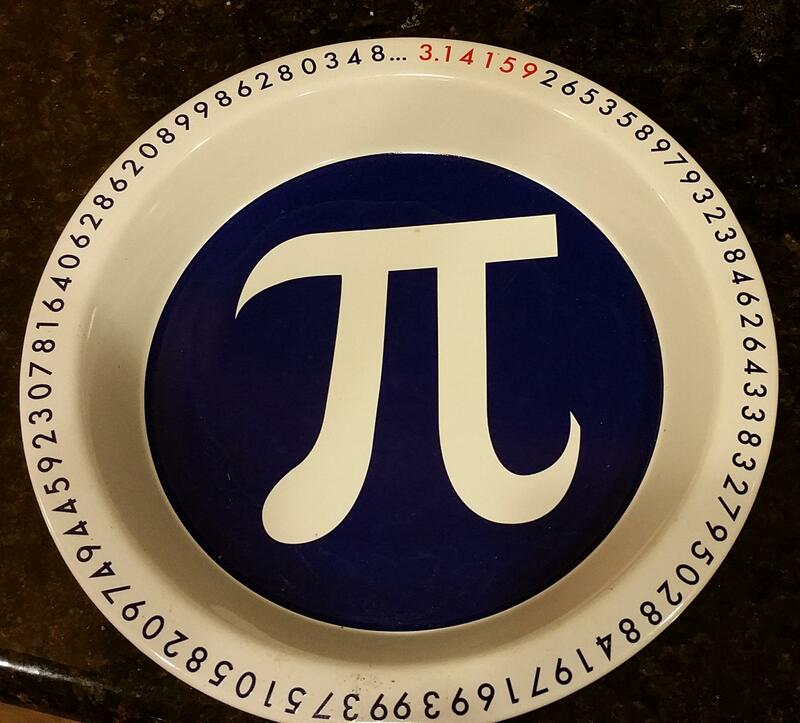 She also brought her Pi plate from her kitchen and reminded Maeve Johnson and others about the significance of 3.1415927….. Harold Burtzloff appeared unimpressed, and would have preferred that Jo had actually put something in the Pi plate, as in pie, we assume. With Harold it’s hard to say. Surprisingly, the usually more enlightened Don Jorgensen agreed with Harold, remarking that an empty pie plate is just, well, sad. Dan Contorno (Mr. Numbers himself), solemnly concurred with the other two gentlemen. An empty pie plate is equal to zero he intoned. It seemed that things couldn’t possibly get more profound until George Rigney remarked that Wednesday was free pie day at Village Inn. Jo vowed (this was in private, to herself) to continue to attempt to communicate with this strange local tribe. Our very own Mary Straus reported on the recent PETS conference in Mesa, AZ. PETS stands for President Elect Training Seminar. 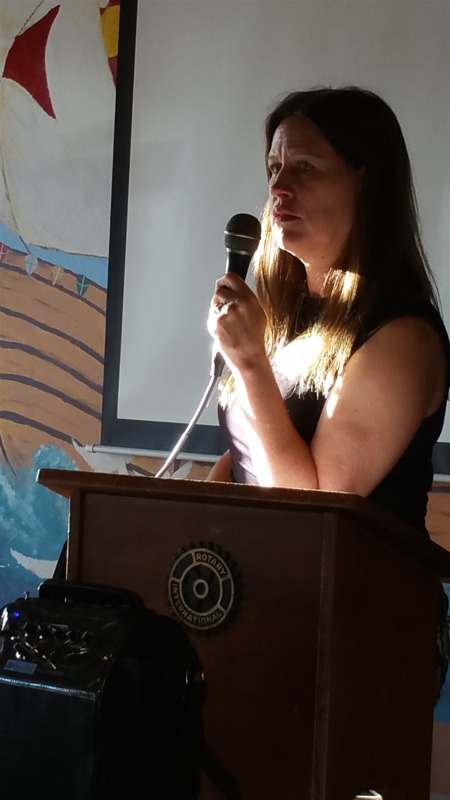 Mary began with an overview of the organization of Rotary International, from zones to districts to clubs (35,000 worldwide). The District Governor facilitates networking between clubs and helps clubs find resources within Rotary. Recently, Rotary International has implemented a new focus on branding, which has impacted our club’s website and logo. Our District is 5500 and our Zone Director is Brad Howard, who spoke at the PETS conference. Mary also covered the Rotary Foundation and the 6 lines of service. Our Club is engaged in 15 projects thoughout the year, seven of which are currently active. It’s time, Mary said, to evaluate our recurrent projects. We look forward to doing just that under the thoughtful leadership of our wonderful President!